This 1846 stone mansion, vacant for 40 years, burned in 1999 and extensive renovations completed in 2002. The home backs on the third fairway of Timber Run Golf Course in the village of Lanark, minutes from Perth. 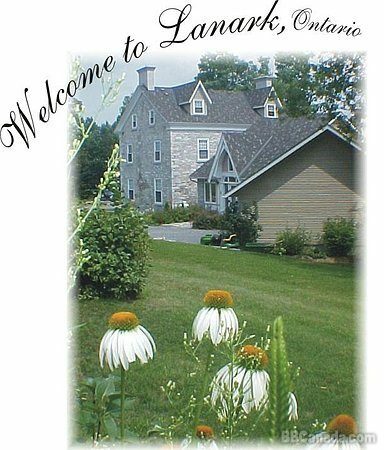 Inground pool and hot tub, in-house spa services and Lanark village offers swimming, fishing, boating, skiing, skiidoing, local artisans and many week-end events in Perth and surronding areas. During your stay at Clyde Hall,enjoy a well appointed suite/guest room,theatre style TV,whirlpool tubs,walk-in showers,tea in the solarium or library,music in the drawing room & homestyle breakfast in the dining room or outdoors on the wraparound deck. We look forward to receiving you at Clyde Hall where comfort is captured in history. Ask about our adventure packages.